The global phytonutrients market consists of a few global and local players. The market is considerably fragmented, says Transparency Market Research (TMR) in a report. The global phytonutrients market share is evenly categorized among a few major companies. There are some noteworthy players heading the global phytonutrients market to deliver quality products to end-users. The most important enterprises operating in the global phytonutrients market are Kemin Industries, Inc., Koninklijke DSM N.V., Pharmachem Laboratories, LLC, Raisio PLC, and Takasago International Corporation. As said in the report of TMR, the global phytonutrients market was valued at US$ 4,331.5 mn in 2016. It is projected to achieve US$ 7,929.5 mn by 2025 by stretching out at a CAGR of 7.1%for the duration of 2017 to 2025. On the basis of type, the global phytonutrients market is segmented into vitamin E, carotenoids, phenolic compounds, phytosterols, flavonoids and other. Among these, the carotenoids category is dominating the market due to rising utilization in the treatment of macular degeneration, cataract, skin damage, and diabetes. Their popularity is fuelled by enormous health endorsing advantages due to their property of anti-oxidation and effects of anti-inflammatory. The development of the segment is driven by an increasing broadness of carotenoids disorders can be used in treatment. The region that accounted for the largest market share is the North America. North America is followed by Europe and Asia-Pacific. 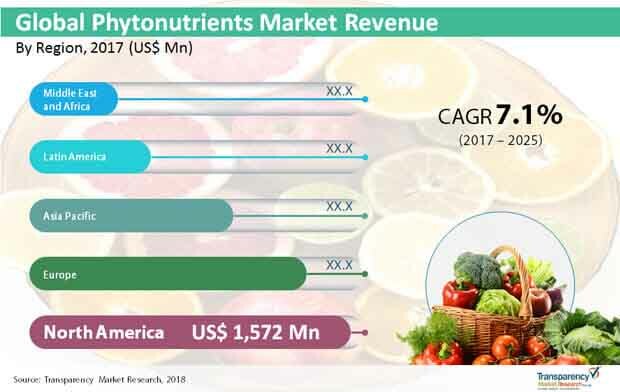 The growth of phytonutrients market in the North America and Europe is expected to lead with the existence of the major market players in the economy. The rising awareness among the people, and the growth in the per capita income of individuals is driving the market. Asia Pacific region is also projected to lead the market. The aspects that helps the growth of the market in Asia-Pacific economy is shifting preferences of consumer and urbanization. Diverse fruits and vegetables comprise phytonutrients which are different and in various quantity hence consuming a diet that contains variation of vegetables and fruits will fuel the usefulness of the phytonutrients. When utilized in mix the outcome that it has on the body rises to a certain level. The benefits of phytonutrients on the health contain reduced LDL cholesterol, growth in the vessel dilation, blood pressure level is normal, cellular damage prevention, better vision, and reduced inflammation. The rising awareness among the user about the health advantages and the improved end-use usage are the aspects that are boosting the global phytonutrients market. The type of phytonutrient that aids to decrease the risk of stroke, blindness, heart disease, and some kinds of cancer is Carotenoids. The other health aids are build-up the lung utility, slowing the aging process, and lessening the affects of diabetes. The rising demand for the healthy food with better amount of nutritional value and the everyday evolving good food habits of the users are the reasons that are driving the demand of the global phytonutrients market. Phytonutrients are not meant for every person also extreme consumption may lead to unconsciousness or allergy that is a prime restraining factor affecting growth of the market. However, need for phytonutrients like carotenoids have shown a high keen towards its consumption due to health aids like certain types of cancer, cardiovascular diseases, and blindness.